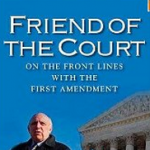 Dan Recommends "Friend of the Court"
Written by Dan’s father, scholar Floyd Abrams, Friend of the Court is the best recent book about the First Amendment. Sure, Dan may be biased, but the book draws from the entirety of Abrams’ career on the front line of major First Amendment cases, gathering speeches, articles, debates, briefs, oral arguments, and testimony to forge legal understanding of free speech. The book is described as follows: “Litigating everything from national-security and prior-restraint issues to controversies concerning the law of libel and attempts by local officials to censor art, Abrams has worked devotedly to protect the First Amendment, the “crown jewel” of America’s Constitution… The writings illuminate topics of ongoing import: WikiLeaks, the correctness of the Citizens United case, journalist shield laws, and, not least, the responsibilities of the press. An exceptional writer and a brilliant thinker, Abrams offers a unique perspective on the First Amendment and the unparalleled rights it confers.” Dan highly recommends you pick up a copy here.